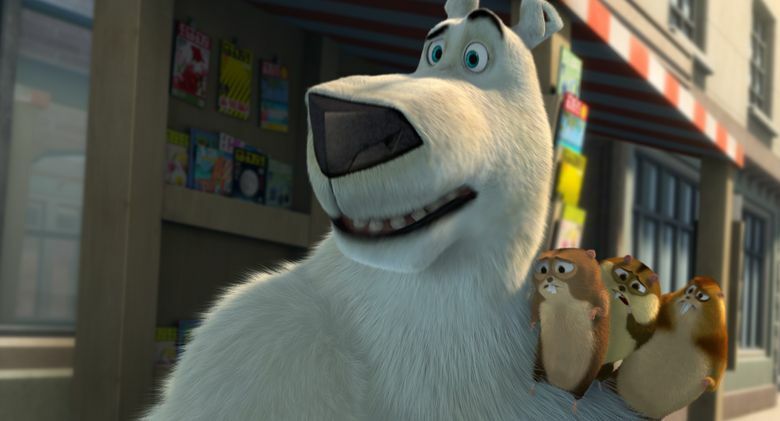 Movie review of “Norm of the North”: This idiotic animated comedy about a talking polar bear makes absolutely no sense. Rating: ½ star out of 4. Hold it. Just a darn second. That is, like, so hard to believe. ‘Norm of the North,’ with the voices of Rob Schneider, Heather Graham, Ken Jeong, Bill Nighy. Directed by Trevor Wall, from a screenplay by Malcolm T. Goldman, Steven M. Altiere and Daniel R. Altiere. 93 minutes. Rated PG for mild rude humor and action. Several theaters. No, no. Not the talking-polar-bear part. Animals in animated kiddie movies talk. It’s what they do. And have done, all the way back to Mickey Mouse’s earliest days. No, it’s that condos-in-the-Arctic bit that, right from the get-go, sends “Norm of the North” tumbling into the sinkhole of illogic, never to emerge. They’re being built for the “1 percent,” the developer dude declares. Oh. And, why exactly? So very, very far from the nearest Mercedes dealership and Tiffany’s boutique, they will be. The premise, to put it mildly, makes no sense. Actually, it makes even less than no sense when Norm (voiced by Rob Schneider) decides the best way to stop the scheming sleaze (Ken Jeong, shouting) is to travel to New York City to use his vocal talents to tout the condo plan because. … There’s no explaining it. Particularly when the promotional campaign of the developer guy involves circulating videos of the enraged Norm charging the camera and later being shot by the bad guy with a tranquilizer dart gun in a pricey restaurant while patrons look on aghast. And those images are then used to boost the developer’s favorability ratings and make the public more disposed to think the condos are just A-OK. Adding to the dismal idiocy of the proceedings is the presence, in the role of Norm sidekicks, of three pint-size flatulent lemmings with buck teeth and serious urinary issues (so many pee gags; it is to cringe) who communicate in frantic chittering gibberish. Think: furry minions with rabies. No. No. Just no. No child should be exposed to this.